There's definitely more than enough space on the package for an extra CPU chip. Read more about AMD's potential 16-core Ryzen 3000 AM4 processor. I don't think heat would be a major issue in most systems, maybe tighter systems would max at the 12-core for full turbo blocks/XFR/whatever, but that 9900K is running at stock clock speed, which for that model is generally where the power draw roughly matched rated TDP, putting it at about 100W for the CPU draw (Roughly where we'd expect given it consumes around 140W in Cinebench when it can push boost clocks). 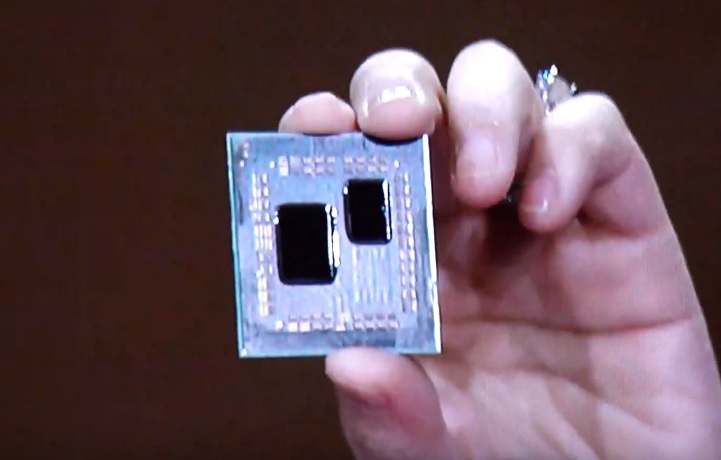 AMD's total system power draw was almost 50W less than Intels, so assuming the chipset and other aspects don't have more than a 5W difference between systems, we can expect this chip to be closer to the 65W range than the 105W parts in whatever configuration they were using there. It's only once you start to near 200W that thermal throttling starts to become an issue with modern soldered CPUs really, and this seems like you could get a 16-core part in closer to the 150W range. I doubt they'll come with this in the first batch of processors though, isn't really any reason for it as they're only competing with themselves/ThreadRipper at that point, presumably Intel's best possible response to the 8 core would be the rumoured 10-core on 14nm, so a 12 core, maybe a 16 later, would make a lot of sense then. Could it be for Vega integrated Graphics maybe? I did think it's possible that could be for a Navi GPU chip but those aren't expected till the 4000 series and we haven't even got the 3000 series release dates yet, plus it seems far too small for a GPU chip. According to some info from other places the Ryzen shown off was a Ryzen 5.